The GoPro Omni is the first professional 360 VR camera system that doesn’t make you take out a second mortgage on your house to buy it. Yes, it cost $5000, if you own 6 GoPro Hero 4 Blacks already, then you can pick it up for $1500. But, what you get with it is 6 GoPro Hero 4 cameras built into a firm, rugged aluminum housing and special 360 Array firmware, this system delivers gorgeous 8k x 4k video at 30fps. If you don’t mind 4K masters instead of 8K, then you can get 60p from it. The GoPro Omni comes with The Omni Rig which includes the 6 GoPro Hero 4 Black cameras, Kolor Software, Switronix HyperCore Battery, Six 32GB MicroSD cards and a 7-port powered USB Hub. Before I go any further, a word about 8K and 4K when it comes to 360 VR videos. The FOV, or Field of View, determines how much resolution that will be seen inside you VR Headset. The new Samsung Gear VR headset has a 101-degree FOV. That means when you break it down you are only seeing approximately 2.6K in front of you at any given time. If you have 4K masters, then you only get approximately 1.3K. That is a pretty significant difference. It is also why I prefer to shoot 8K over 4K in 360. 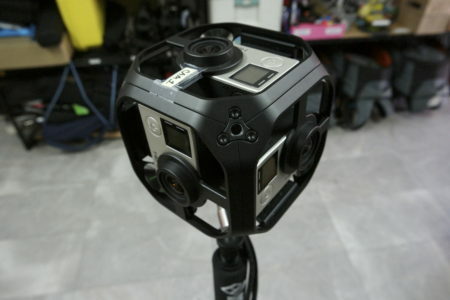 But, how do you use the GoPro Omni to shoot 360 VR? Let’s take it step-by-step. Once you get everything out of the box, you will still need a good monopod with feet or you can use a light stand. I love my iFootage MoGoPod , but there are many out there. The important factor is that you need a small base to make it easier to replace in your final video. Next, monitors. Sorry, you can’t use your smartphone and GoPro App for the Omni. But you can plug into the HDMI port on the Hero’s to get an output to check your shot. What, you thought you just sit it down, and it records all around without you having to do anything? Well it does, but, to create professional results and to save yourself from countless hours of stitching on just one shot, then you need to see where you have placed the cameras and your talent or object of interest. 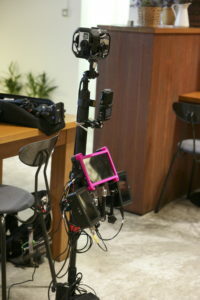 In the picture, you can see that I am using my Atomos recorders as monitors. I love the image quality, and they give me a waveform and vectorscope for checking my video. I used the Atomos Shogun and two Atomos Blades . You will note that I have one monitor set in normal landscape mode and the other two set in “portrait” mode. This lets me see how my shot is set and try to avoid putting anything critical in the “seam” lines. I will be doing another story that covers shooting tips and tricks later. 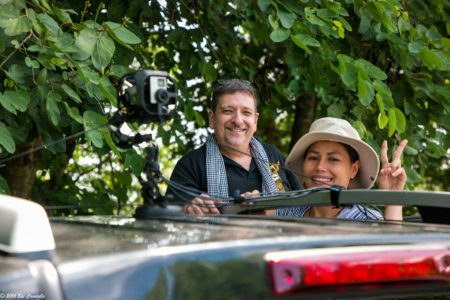 The GoPro Omni mounted to my Truck for 360 driving shots. Audio is another concern. Your GoPro Hero 4’s will pick up sound but not in the way that you need it for 360 immersion. I use the Zoom H2N recorder . I believe that it is the lowest priced, best recorder to use. The Zoom H2N got a special firmware update not long ago that enabled Spatial Audio. That means the five microphones built into the H2N are recording front, back, right, left and up, down. This will be very important when Google Daydream comes into play. As for software, the $5000 package includes Kolor Autopano Video Pro and Autopano Giga. As part of that package you also get an essential piece of software called the Omni Importer. This software saves you a tremendous amount of time. When your shoot is complete you remove the microSD cards and place them into the 7-port USB Hub and plug it into your computer. Open the Omni Importer and the software miraculously recognizes the cards and organizes them. 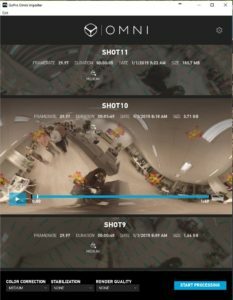 The display shows you thumbnail views of your 360 shots. 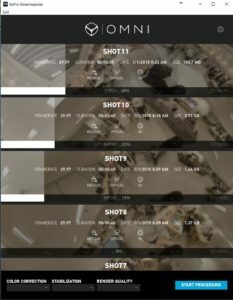 These are active low res video taken from the .lrv files that your Hero captures at the same time that it is capturing the 2.7K video. You can play them to check for any problems with your scene. This is the first time that you can see your shots. There is no in-camera playback. You have the choice of having the software do three levels of “color correction”. In this case, the color correction will blend the 6 cameras to make the overall image the same, correcting for any hot spots or extreme color differences. Optical Stabilization is another option and finally, you can render what I call a check file in 2k, 4k or 8k. For my settings, I choose Medium color correction, optical stabilization, and no rendered check file. The reason that I don’t use the check file has to do with the horizon in the file. The software does not give you a straight horizon line, that has to be done in Autopano Giga and saved to Autopano Video Pro, so I have no need for this video file. Once you’ve gotten to this step, you will now be ready to edit your 360 video files. Right now, Adobe Premiere Pro CC 2015.3 is the best software to use. You will need After Effects and even Photoshop to get the job done. The other essential piece of software is Mettle SkyBox. There is a new Mettle SkyBox Suite available that includes SkyBox Studio, SkyBox 360/VR Transitions, SkyBox Post Effects, SkyBox 360/VR Tools and SkyBox VR Player. If you want to see how the SkyBox 360VR Transitions work, click here to refer back to my story and my video tutorial. In an upcoming story, I will go over the workflow for stitching your 360 VR videos using Kolor and after that, I will dive into editing 360 VR videos. Great stuff Al! I wish I had this when I was starting out! Hi from my farm in Amity Oregon. My family makes Leupold optics for over 100 years and i am trying to make a 360 video. I have the full omni kit. 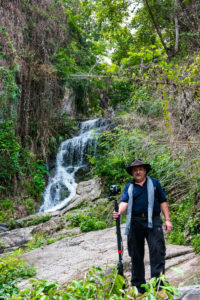 I have struggled with confusing tutorials about autopano and giga… How do i shoot 8k as you suggest? How do i render it? Would you consider being payed to do a skype lesson? In any case i appreciate you sharing your knowledge. I took my Omni to Silver Creek Falls and shot this beautiful setting and noticed you also filmed a waterfall. I love VR and work with sick kids and paralegics as i have seen how it can help people in profound ways. Any help is appreciated.